The Autumn litter is here, and this time, we’ll be supporting Joisey! We are so pleased to announce that proceeds from this campaign will go to Animal Welfare Association, South Jersey’s largest and oldest no-kill animal shelter! Psst! This is Eagle and he is up for adoption right now and totally adorbs! All healthy and adoptable companion animals that come through AWA’s doors are given as long as it takes for us to find them a home of their own, regardless of age, beauty, or infirmity. In addition, we provide medical care and treatment for our shelter guests who need a little something extra to make them adoptable. Thank you Animal Welfare Association! In case you’re new here, a little more info for ya’. 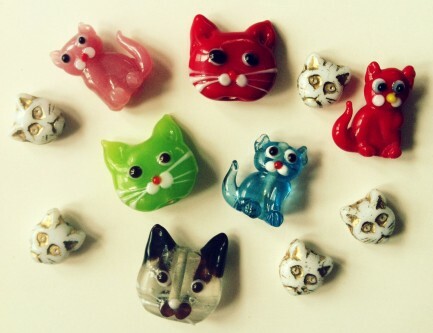 You can choose what size kitty you’d like; the choices are Trinket $25 (around 2 to 3 inches), Mantle $32 (4 to 7 inches) or Centerpiece $40 (8 to 12 inches.) Read more about Teal Cats here. We do combine shipping so don’t hold back on ordering more than one. Throw in a T-shirt, or an apron, too! Shipping may take 2 to 4 weeks, so be patient, your new friend is coming! 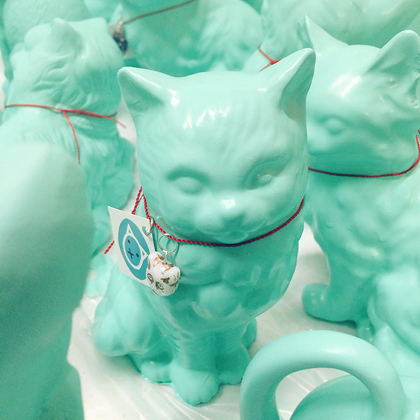 Once again, our latest litter of teal kitties have a really cute charm that is shaped like (wait for it…) A KITTY! They look adorable hanging alongside the Teal Cat Project tags. All Teal Cats come with a little card (think of it as an adoption certificate) that explains the Teal Cat Project mission, so if these are gifts your recipient will not be left in the dark. We’d be happy to write a short, personalized note if you ask for it in the comments when you purchase your Teal Cat. Cats sell out FAST so hurry up and get yours. Thank mew for the support!